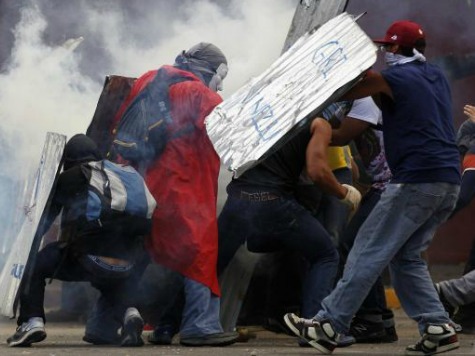 Clashes in Venezuela between peaceful protesters and Venezuelan state police have claimed the lives of three more citizens – one not participating in protests at all – bringing the death toll since February 12 to 34 people and increasing the call for an end to government violence in the country. According to Argentine news outlet Infobae, 31-year-old Wilfredo Rey was shot in the head in the western capital of San Cristóbal despite not participating in protests. 40-year-old Jesús Labrador was shot during protests in the province of Mérida, and 26-year-old protester Argenis Hernández was shot in the abdomen during protests in Valencia, the capital of central province Carabobo. Spanish newspaper ABC reports that Hernández was shot by a Chavista paramilitary member on a motorcycle, who drove by and shot at protesters attempting to barricade the city from the government. More than a month into the latest wave of protests, triggered by the arrest of Popular Will party leader Leopoldo López, the government announced a “probe” into human rights abuses by state police. The protests continued throughout the weekend, however, led in Caracas by López’s wife, Lilian Tintori, and former opposition presidential candidate Henrique Capriles Radonski. Newly-christened public enemy #1 María Corina Machado spearheaded another wing of protests. Protesters in Caracas numbered in the thousands, as the mayor advertised the event on Twitter. After threatening and executing a raid on Altamira Square, a major opposition stronghold in Caracas, Maduro sent troops into the square once again on Saturday, spraying tear gas and attacking protesters. The police also arrested a journalist, Mildred Manrique, who lives in a building in the square, for reporting on attacks on civilians by military personnel. The capital of Táchira, the Andean college town of San Cristóbal, was run by a staunchly anti-Chavista opposition mayor until late last week, when Venezuelan secret police stormed Mayor Daniel Ceballos’ home in the middle of the night and arrested him for disturbing the peace and “fomenting violence.” The arrest of Ceballos and conviction of Mayor Enzo Scarano of San Diego (a town near Valencia in Carabobo) triggered increased threats from President Maduro that he was now targeting public officials that opposed the government, not just protesters. Members of the opposition have stated repeatedly that they have no intention of ceasing to protest until Maduro sets free political prisoners and orders an end to military violence.